Eric Baratta joins HousePaws as a former client and dog daddy of four past and present HousePaws patients. Eric has a graduate degree in Theatre from Villanova University, and graduate degrees in Landscape Architecture and Historic Preservation from the University of Pennsylvania, where he worked for many years as an administrator, course instructor, technical director and designer of things theatrical. Eric has also worked in both public and private sector roles in landscape architecture, planning and historic preservation. Eric is excited to join a diverse and pretty wonderful group of people who share his love for animals at HousePaws. Eric lives with his wife, two children and HousePaws-rescued dog in Burlington, NJ. 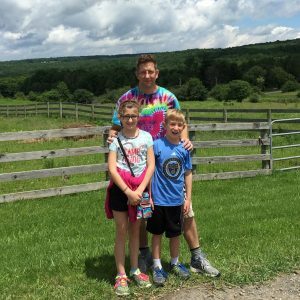 When not working creatively and operationally at HousePaws, you might find Eric watching soccer on TV, at his son's games, and at the Philadelphia Union's stadium. You might also find him with his trusty iPhone 6 photographing the tiny visitors who creep, crawl and fly to his mostly native plant backyard garden.